Russell Dean was born in Montgomery and grew up in Jackson, Alabama. In 1974, he married his high school sweetheart, Amy Morton. Graduating from Auburn in 1975 with a degree in Mass Communications, he didn’t know that degree would prove useful thirty years later in 2005. Russell was a high school football and baseball coach for seven years at Jackson High School. He was fortunate to be on the 1979 football staff that won the AAA State Championship. Several years later he became the sales manager with New York Life in Mobile. 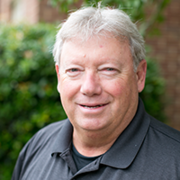 After graduating from New Orleans Baptist Theological Seminary in 1989, he served churches in Louisiana and Alabama before coming on board with Faith Radio in February of 2005. Russell and Amy have three grown children. Sam and wife, Sherise, live in Eclectic with daughters, Elin and Ava. He serves full time with the Alabama National Guard. Benjamin, and wife, Leslie, work for a military contractor at Fort Rucker while living in Enterprise. Emily is a math instructor at Auburn High School. She and her husband, Devin, have four children: Dean, Emma James, Preston and Brooks. Anthony Counts is the worship pastor of Lake Pointe Baptist Church. He has served the Lord in various capacities for many years, and retired from the full-time pastorate in October of 2015. He has a passion for meaningful, life-changing worship, and is quoted as saying, “Everything we do in the spiritual realm is empowered by our worship”. He and his wife, Sylvia, encourage you to worship with us at Lake Pointe, and see if God will not change your life in very positive ways. The Scriptures clearly teach that acceptable worship is that which is done in spirit and in truth. We invite you to experience that kind of worship every time we meet together. Curtis Latham is our Minister of Discipleship and Small Groups here at Lake Pointe Baptist Church. Answering the call God has placed on him, he is currently completing seminary at Liberty Baptist School of Divinity. He has a deep affinity for all things discipleship and his passion is to “make disciples who make disciples.” As a fifteen year veteran in the U.S. Air Force, Curtis is a drilling reservist who is using his gifts and world-wide experiences to help make disciples of Jesus Christ. He and his wife Pauli have two children Caleb (9), and Lilli (7). Curtis looks forward to serving along side you in our church's part in fulflling The Great Commission.